Its a NEW YEAR. That means everyone is reflecting on the last year, thinking about what they want to achieve in the new year and coming up with their NEW YEARs RESOLUTION; I want to lose weight. I want to be more organized. I want be more confident. Those are just some I’ve had over the years. I want to do this and I want to be that is what everyone’s saying. You know what my new years resolution is? No, its not to study harder; No, its not to concentrate more; No,Its not to lose weight (although it should be); Its not even to tell my father that I don’t want to be a doctor. MY NEW YEARs RESOLUTION IS TO BE HAPPY. 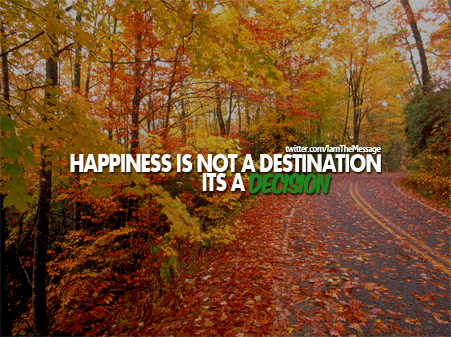 I’ve come to a point in my life where i realise that happiness is not a destination. its a decision. You’re not working, studying, doing whatever you’re doing so ‘one day’ you can be happy. Life is too short! Death is too sudden. 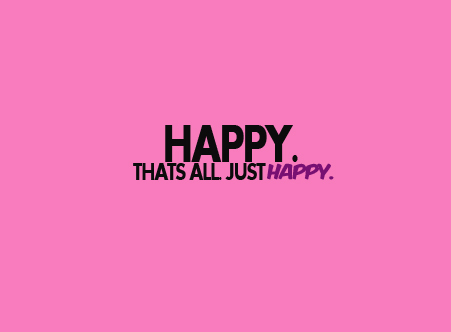 BE HAPPY NOW! Choose to smile, to laugh, to dance. Choose to do it NOW. NOW is the time to be happy. Now is a PRESENT, tomorrow is uncertain and the past is gone. Last year, I spent too much time dwelling on the bad things going on in my life. Too many times I told myself ‘I’m not going to be happy’. You know what, Maybe I’m right, Maybe I’m not GOING to be, But as of right now, I can be. If I let myself be. I will smile because I deserve to, I will laugh and dance because I have more to be thankful for than to be saad about. Stop thinking about the future, you might not get one. That Doesn’t mean you shouldn’t plan your life, but don’t let the future take over your present. Don’t count the number of things going wrong in your life. Count the number of things going right. Count the number of ways you can make the wrong things go right. So yes, this year I would like to study harder and concentrate more on what’s important. I would like to lose weight (AMEN) and I definitely want to tell my dad I don’t want to be a doctor. But if none of those resolutions happen, I will still be content with just being happy. follow @MrTuneri & cool kids like @Oyin_XO & @IamTheMessage who contributed to this lovely blog post.